Today, the most important device a person must have is their cell phone. Cell phones are a rage all over the world because of how easy they make your communications activities. There are lots of brands in the Cell Phone Market such as Nokia, Motorola, LG, Samsung, Sony to name a few. Check the navigation aspect about the model you select. Is it easy-to-use and quick to understand? If you are a busy professional, you might want a menu system which gives quick access to your contacts page. How many names and numbers can the phone store? Those of us, who use our phone to store any contact number we come across, would definitely need a phone that can store some 1000 contact details or more. How many ringtones does it offer? Does it give you the facility of creating your own ringtones? Does it enable you to assign ringtones to specific callers? These ringtone features are of particular importance to those who use them in different ways. So, check up on this.What about the memory space. Is it large enough for you to store your photos, wall papers and screensavers? Those of us, who like to share images with friends and family, need a phone with good memory capacity to store such images. So, check on this feature. Most cell phones today come with a camera. If you want to take really good snaps with yours, go in for a model with a 2 megapixel or above camera. This enables you to shoot quality photos and also take videos that look good.Most people use Bluetooth-enabled devices for wireless connectivity. If you wish for connectivity through your cell phone, look into the availability of this feature in your model. Are you someone who likes to listen to music while on the go? If so, check for MP3 facility. This way you can transfer your music files to you phone and listen to all the cool songs wherever you do. Most often such phone models have a USB slot for file transfers. In case you don’t want an MP3 payer, but can make do with just the FM as FM is what you like to listen to all day, check for an FM tuner feature in the phone.Look into the test messaging feature. Do you send message by SMS, MMS and EMS regularly? If so, you are going to need a phone that gives you versatile messaging facility and also a predictive text tool for quicker text messaging. Look into these points and you can be sure of finding a cell phone with a host of quality features that you will find very useful for your personal and professional cell phone usage. I am just about done thinking about the WWDC. I wish more had happened on the Macintosh front. I love what has happened with the iPhone, but I really want to see something new from Apple in regards to computers. I am excited to see that Snow Leopard is coming out. I think this will not be a for everyone upgrade, but it should increase speed and reliability and open doors for the future. I think the biggest problem with the “high” that is an Apple Event is that I am already over this one and looking for to the next big thing Apple has coming. Is this for real? It appears to be edited slightly. What do you think? If it is real this girl needs to be booked on Letterman so she can get some serious props and credit for that amazing catch! More news for the June bride–June 2011, that is. Get married in space. Well, some 62 miles up there, to be precise, on the Rocketplane XP suborbital spaceplane. The one-hour flight-plus-ceremony will cost $2.2 million, but it’s actually a bargain because the price includes the wedding dress. The price also includes a telecast for guests, but it appears that reception food and drink is still on you. I stumbled across this great Mac vs. PC ad yesterday while setting up my new computer (no, not a new mac, but a new PC for work and yes, I “downgraded” to XP). I just found it on YouTube as a video, but the original ad was just a scrolling ad at the top with the guys on the side further down the page. I think this is a great reinvention of something familiar in a new and attention grabbing way. You may not get excited by mice, but I have quite a collection of the cute critters. There’s the Logitech multi-media zoomer, my pink Kensington travel model, the Wow-Pen ergonomic version, not to mention the drawer full of reject mice that weren’t up to my exacting standards. 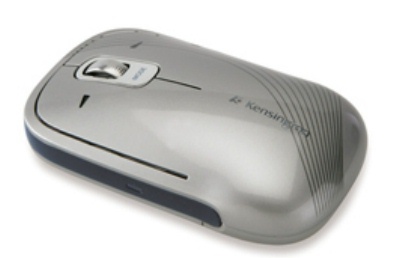 The SlimBlade Presented Mouse by Kensington is my newest pet. It combines a full-function laser mouse and presenter in one sleek device, and is still small enough to fit in your pocket. Bluetooth connection; switch to go to presentation mode; goes to sleep when your notebook does; ultra-thin design for traveling – what’s not to love? $59.99 at Kensington.